Cut your organizational time commitment by up to 40%! Livescoring makes all the difference! Even more professional charity auctions! are you planning a premium golf event? Event management becomes less complicated when you are equipped with the right software. of your event with a custom IT platform. 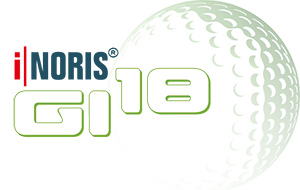 The specialized software i|NORIS®-GI18 is your tool when it comes to efficient management and processing of participant and event data during your tournaments. Over the years, we have gained extensive knowledge by organizing our own events, which is important for the organization and execution of a premium event. We support you with our experience and submit qualified advice on possible issues. On our hotline you will find focused professionals as your contacts, ones that combine two areas of expertise: long-standing proficiency in organizing golf specific charity events as well as the absolute IT competence of a software company.